Benarkah ura-ura mengatakan akan ada serangan Anonymous Hackers yang kedua?? Allow me first to apologize for this interruption. I do, like many of you, appreciate the comforts of every day routine the security of the familiar, the tranquility of repetition. I enjoy them as much as any bloke. But in the spirit of commemoration, whereby those important events of the past usually associated with someone's death or the end of some awful bloody struggle are celebrated with a nice holiday. I thought we could mark this day sixteenth of june, a day that is sadly no longer remembered, by taking some time out of our daily lives to sit down and have a little chat. There are of course those who do not want us to speak. I suspect even now, orders are being shouted into telephones, and men with guns will soon be on their way. Why? Because while the truncheon may be used in lieu of conversation, words will always retain their power. Words offer the means to meaning, and for those who will listen, the enunciation of truth. And the truth is, there is something terribly wrong with this country, isn't there? Cruelty and injustice, intolerance and oppression. And where once you had the freedom to object, think, and speak as you saw fit, you now have censors and systems of surveillance coercing your conformity and soliciting your submission. How did this happen? Who's to blame? Well, certainly there are those more responsible than others, and they will be held accountable, but again truth be told, if you're looking for the guilty, you need only look into a mirror. I know why you did it. I know you were afraid. Who wouldn't be? War, terror, disease. There were a myriad of problems which conspired to corrupt your reason and rob you of your common sense. Fear got the best of you, and in your panic you turned to the now Prime Minister. He promised you order, he promised you peace, and all he demanded in return was your silent, obedient consent. We have seen the censorship taken by the Malaysian government, blocking sites like The Pirate Bay, and WikiLeaks. Malaysia is one of the world's strictest governments, even blocking out movies, and television shows. These acts of censorship are inexcusable. You are taking away a basic human right. The internet is here for freedom, without fear of government interference. Do not think that no one else notices. Your structured government has done the talking, and we hear loud and clear. Let this be an announcement to all your people. This is a sign, a warning, and an opportunity to listen to ideas above your own. In a way you are being stubborn. But how will this help anyone or your country. We fear that if you make further decisions to take away human freedom. We are obligated to act fast and have no mercy. For rules were meant to be broken. And corruption was meant to be washed away and forgiven. Now we will wash your corruption away so be prepared. Take this as a favor. We shall bring down the entire countries national infrastructure. We shall make this a day to be remembered. This is your second warning. Betulkah anonymous akan melancarkan Operation Malaysia 2 atau Op Malaysia kedua. Benar atau tidak Hackers anonymous ini menghantar mesej tentang serangan Operation Malaysia 2 atau Op Malaysia 2 atau gelombang kedua. Serangan hackers sebelum ini, jelas menjejaskan hampir 200 laman web kerajaan, blog, portal dan forum tak terkecuali juga twitter serta facebook pun kena hack. Samada ia palsu atau benar langkah keselamatan perlu diambil. 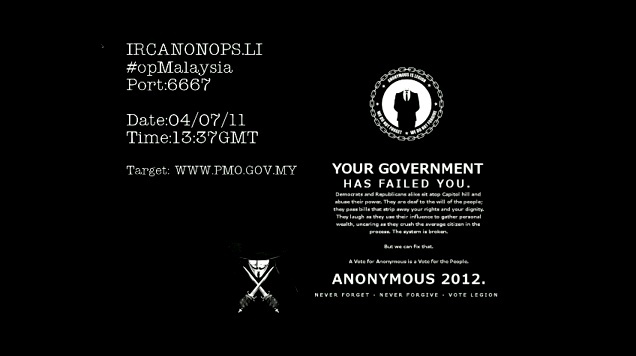 Serangan kali kedua ini dirancang akan dilakukan pada 9.30mlm, 4 julai 2011 dan mensasarkan laman web kerajaan Malaysia iaitu PMO.gov.my. Samada benar atau portal atau laman web PMO.gov.my akan kenahack kita tengok mesej video Hackers anonymous ini yang diedarkan melalui youtube. kalau tak faham korang translate la sendiri bahasa melayu..
Pirate Bay Offline? Malaysia Bay Online !